After the limited success of the Third Crusade (1189–1192), there was little interest in Europe for another crusade against the Muslims. The crusaders had lost Jerusalem to the Ayyubid dynasty, which ruled all of Syria and Egypt, and only a few cities along the coast were still held by the crusader Kingdom of Jerusalem, now centered on Acre. The Third Crusade had also established a kingdom on Cyprus. Pope Innocent III succeeded to the papacy in 1198, and the preaching of a new crusade became the goal of his pontificate. His call was largely ignored by the European monarchs: the Germans were struggling against Papal power, and England and France were still engaged in warfare against each other. However, due to the preaching of Fulk of Neuilly, a crusading army was finally organized at a tournament held at Écry by Count Thibaut of Champagne in 1199. Thibaut was elected leader, but he died in 1201 and was replaced by an Italian count, Boniface of Montferrat. Boniface and the other leaders sent envoys to Venice, Genoa, and other city-states to negotiate a contract for transport to Egypt, the object of their crusade; one of the envoys was the future historian Geoffrey of Villehardouin. Genoa was uninterested, but in March 1201 negotiations were opened with Venice, which agreed to transport 33,500 crusaders, a very ambitious number. This agreement required a full year of preparation on the part of the Venetians to build numerous ships and train the sailors who would man them, all the while curtailing the city's commercial activities. 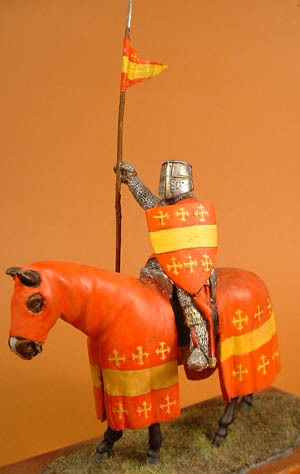 The crusading army was expected to comprise 4,500knights (as well as 4,500 horses), 9,000 squires, and 20,000 foot-soldiers. The majority of the crusading army that set out from Venice in October 1202 originated from areas within France. It included men from Blois, Champagne, Amiens, Saint-Pol, the Ile-de-France and Burgundy. Several other regions of Europe sent substantial contingents as well, such as Flanders and Montferrat. Other notable groups came from the Holy Roman Empire, including the men under Bishop Martin of Pairis and Bishop Conrad of Halberstadt, together in alliance with the Venetian soldiers and sailors led by the doge Enrico Dandolo. The crusade was to be ready to sail on June 24, 1202 and make directly for the Ayyubid capital, Cairo. This agreement was ratified by Pope Innocent, with a solemn ban on attacks on Christian states.As there was no binding agreement among the crusaders that all should sail from Venice, many chose to sail from other ports, particularly Flanders, Marseilles, and Genoa. By 1201 the bulk of the crusader army was collected at Venice, though with far fewer troops than expected: 12,000 instead of 33,500. About 4-5,000 knights and 8,000 foot soldiers showed up for the off. The Venetians had performed their part of the agreement: there lay 50 war galleys and 450 transports - enough for three times the assembled army.The Venetians, under their aged and blind Doge Dandolo, would not let the crusaders leave without paying the full amount agreed to, originally 85,000 silver marks. The crusaders could only pay some 51,000 silver marks, and that only by reducing themselves to extreme poverty. This was disastrous to the Venetians, who had halted their commerce for a great length of time to prepare this expedition. In addition to this about 14,000 men or as many as 20-30,000 men (out of Venice's population of 60-100,000 people) were needed to man the entire fleet, placing further strain on the Venetian economy. Dandolo and the Venetians succeeded in turning the crusading movement to their own purposes as a form of repayment. Following the Massacre of the Latins of Constantinople in 1182, the ruling Angelos dynasty had expelled the Venetian merchant population with the support of the Greek population.These events gave the Venetians a hostile attitude towards Byzantium. Dandolo, who joined the crusade during a public ceremony in the church of San Marco di Venezia, proposed that the crusaders pay their debts by attacking the port of Zarain Dalmatia. The city had been dominated economically by Venice throughout the 12th century, but had rebelled in 1181 and allied with King Emeric of Hungary and Croatia. Subsequent Venetian attacks were repulsed, and by 1202 the city was economically independent, under the protection of the King. The Hungarian king was Catholic and had himself agreed to join the Crusade (though this was mostly for political reasons, and he had made no actual preparations to leave). Many of the Crusaders were opposed to attacking Zara, and some, including a force led by the elder Simon de Montfort, refused to participate altogether and returned home. While the Papal legate to the Crusade, Cardinal Peter of Capua endorsed the move as necessary to prevent the crusade's complete failure, Pope Innocent III was alarmed at this development and wrote a letter to the Crusading leadership threatening excommunication.